Online Registration is closed. Please refer to 'Registration Options' below for details on how to register either Friday or Race Day. When Wesley Korir trains in Canada, he does so on the rural gravel roads of Wellesley Township. The 2012 Boston Marathon Champion is accustomed to training the rural roads of Cherangany, Kenya. 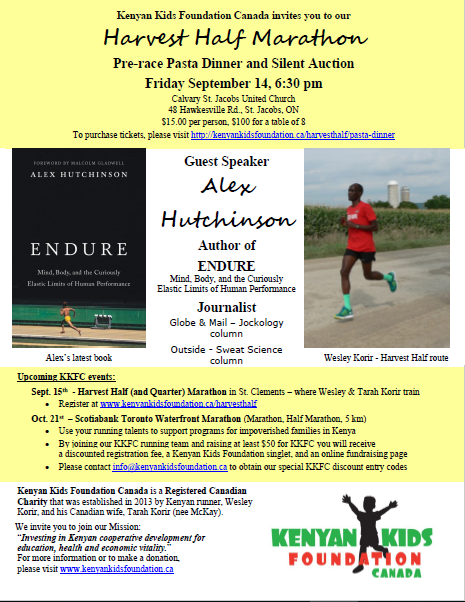 He co-founded the Kenyan Kids Foundation of Canada to support various initiatives there, and this race serves as a fantastic training and racing experience, as well as a fundraising opportunity for the KKFC. Visit the beautiful Wellesley Township this fall and see what this great event has to offer. Individual, Fun Run, 12 and Under. Price includes tax. Join the Kenyan Kids Foundation Canada on the eve of the 2018 Harvest Half for a fundraising pasta dinner. This year's guest speaker is Alex Hutchinson, author of the 2018 book Endure: Mind, Body, and the Curiously Elastic Limits of Human Performance. To purchase tickets, or for more information, click here. Past speakers have included Krista Duchene, Ben Kaplan, and Lanni Marchant. Mail in: To 2 Weberlyn Crescent, Conestogo N0B 1N0 by Tuesday September 11 at 5:00 p.m.
Drop off: At Runners’ Choice, 55 Erb St E, Waterloo by Tuesday September 11 at 5:00 p.m.
Online: Right here at www.RaceRoster.com by Wednesday September 12 at 6:00 p.m.
St Clements Arena, Saturday September 15, 7:00 a.m. - 8:30 a.m.
Join us for the pre-race pasta dinner! The 2014 Special guest speaker was elite Canadian Marathoner Krista DuChene, the marathon mom. The 2016 Special guest speaker was Lanni Marchant, 2016 Olympian in the 10,000m and Marathon and Canadian Marathon record holder 2:28:00. TICKETS SELL OUT EARLY - PLEASE ORDER EARLY, SPACE IS LIMITED! We recommend parking at the St Clements Arena. St Clements Arena (Peter St), 9:00 a.m.
St Clements Arena (Green St), 12:15 p.m. Courses are subject to change pending approvals and course certifications. The time limit to complete the course is calculated at 10 minutes per kilometer. Starting at the half way mark, if a participant does not reach a km mark by this calculated time, the participant will be asked to move to the shoulder/sidewalk and finish the race as a pedestrian, unassisted by race support. Participants are asked to familiarize themselves with the course route if this situation might be a possibility to them. We wish to minimize traffic disruption caused by our event, and value the support of Police services regarding participant safety, and trust you understand our position. Following your run, enjoy great food, music, massage and draw prizes. After the main event is a half mile Kids Fun Run too! ALL HALF MARATHON FINISHERS will receive a finisher's medal at the finish line. All unclaimed medals will be available for pickup at Runners' Choice any time after Monday September 24, 2018. The sponsors recognized on this page have generously contributed financial support, products and/or services to The Harvest Half and we encourage your ongoing support of these generous companies and organizations. This race and fundraiser for the Kenyan Kids Foundation Canada, wouldn’t be possible without the support of these local businesses! 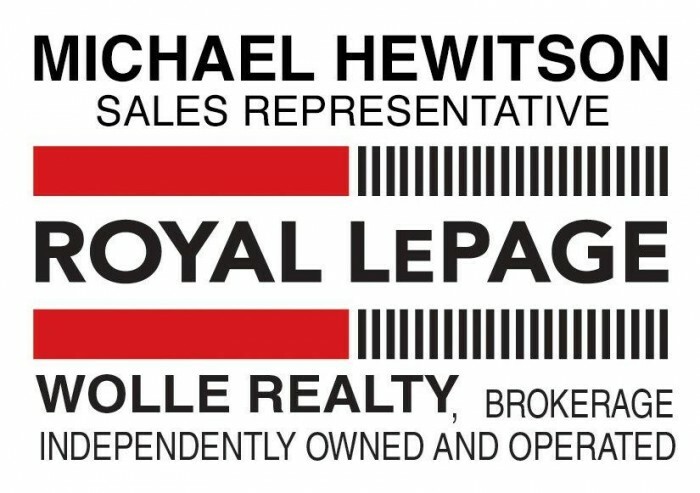 Gold level: Home Hardware Wellesley, Dairy Farmers of Canada, and Gay Lea Foods. Check out our gallery at RunWaterloo.com for thousands of race photos - all free to download.